Have you ever found yourself frustrated because you missed an important event at your child’s school or the most important game of the season for your child’s sports team because you couldn’t take the time away from work? If you answered yes, you are probably searching for that one job that allows you the flexibility to be there for all of those special events you don’t want to miss. A family friendly work schedule can be found by owning a Miracle Method franchise. Miracle Method offers a family friendly work schedule. Most Miracle Method franchisees workweek is Monday through Friday from 8 a.m. to 5 p.m. However, advance scheduling will allow you to work when you want to, so you’ll never miss out on those very important times in the life of your children and family. Being your own boss and setting your own schedule is not something you’ll find in the corporate world. Along with a family friendly work schedule, owning a Miracle Method franchise means you’re entering an industry with almost guaranteed profits. The refinishing business is very recession resistant as most homeowners are still willing to spend money if they are receiving great value. For example, few people are willing to pay $5,000 – $6,000 for granite countertops, but they will spend $800 – $1,000 to update and refinish their existing counters. 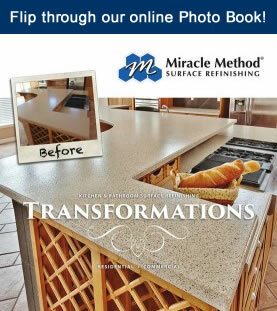 We offer the value alternative to expensive replacement, which is why Miracle Method’s sales are at an all time high as more homeowners continue to learn about the many benefits of refinishing. If owning a Miracle Method franchise sounds like the business you’ve always wanted to manage, , feel free to visit our website for more information, or give us a call at 888-444-8827.